Jamey Albrecht, forage portfolio marketing leader with Mycogen Seeds, has been recognized as a Future Giant of the Seed Industry by Seed World magazine, in partnership with the American Seed Trade Association (ASTA). 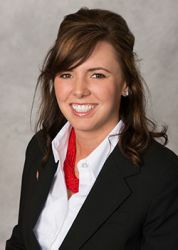 Albrecht was among the top four national nominees honored at ASTA’s 132nd annual convention in Washington, D.C.
Albrecht began her career with Mycogen Seeds as a sales representative in 2009. Starting in a new territory in the Pacific Northwest, she helped build the Mycogen brand and forage product offering in the area. She was named 2011 Mycogen Seeds Rookie of the Year and honorary member of the Washington State University Dairy Club for these efforts. Albrecht continues to use her first-hand field experience to add value in her current role. She is now responsible for strategically aligning products, resources and investments to grow the company’s forage portfolio, including Mycogen® brand bm3 BMR, TMF and alfalfa products. Outside of work, Albrecht is a member of the National Agri-Marketing Association and raises and shows beef cattle. The Future Giants of the Seed Industry was created by Seed World and ASTA’s Future Seed Executives. The program honors individuals early in their careers who work with seasoned veterans to learn about industry issues, acknowledge the past and are led by a true passion for agriculture and the seed industry. Andrew Ferrel, commercial agronomist for Mycogen Seeds in Indiana, was also recognized among the top four national award nominees. Albrecht and Ferrel continue Dow AgroSciences’ legacy of leadership in the seed industry. For more information about the 2015 Future Giant of the Seed Industry Award finalists, visit SeedWorld.com. Mycogen Seeds is one of America’s fastest-growing seed companies, offering leading genetics in corn, soybeans, silage corn, sunflowers and canola. A retail seed company of Dow AgroSciences LLC, Mycogen Seeds maintains a robust global research and development program to bring growers high-performance genetics with the latest trait technologies. Working together, the people of Mycogen Seeds help growers find opportunity in every acre. For more information about Mycogen brand products, visit www.mycogen.com. Follow Mycogen Seeds on Facebook and YouTube.